Of course, as a substitute for all this, you can stay organic and simply top dress your lawns with compost in spring and fall. The information given below is presented simply as a courtesy to homeowners who are more comfortable following conventional feeding schedules and using products (from Scotts, in this example) with high brand-name recognition. 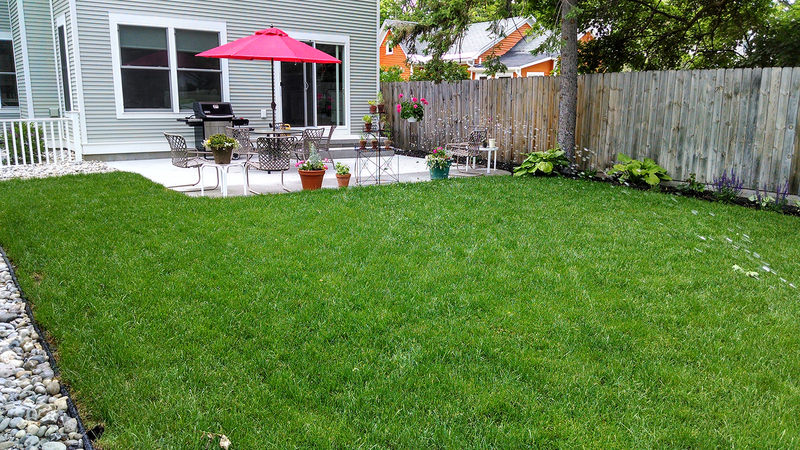 Apply a fertilizer called “Scotts Turf Builder With Halts Crabgrass Preventer” in April or May. Fertilizing lawns goes hand in hand with weed control, and crabgrass is perhaps the most feared weed. If you prevent crabgrass seed from germinating in the spring, you save yourself the trouble of having to battle it in the summer. “Scotts Turf Builder With PLUS 2 Weed Control” can be applied in June. This fertilizer fills the need for additional weed control, as the herbicide component fights everything from ground ivy to purslane to white clover. In July or August, apply “Scotts Super Turf Builder with SummerGuard.” This fertilizer is billed by Scotts as a product that “strengthens and summer-proofs your grass” while “combating a spectrum of harsh seasonal threats like insects, heat, and drought.” Another way to fight drought is to grow tall fescue grass, which is drought-tolerant. Finally, Scotts winterizing fertilizer should be applied in fall. Fertilizing lawns with this and similar products will not only prepare grass for winter but also give you a head start towards achieving the green turf that you will want next spring, bringing us full circle. Before fertilizing lawns with these products, read the instructions on the bag carefully (or ask someone at the store for details). A particular product may not be suitable for your type of grass. Likewise, when applying fertilizers, follow directions to the letter. These directions will tell you how much to apply, how often they should be applied, and under what conditions they should be applied. The job is best done with a fertilizer spreader, such as a drop spreader. Be advised not to fill the applicator with the spreader parked on the grass. Doing so invites grass-burn, as you may accidentally discharge too much while loading. Instead, fill the applicator somewhere else, then wheel the spreader onto the grass.